If you want to take pictures of the night sky then one of the best places in the world to do it is on the top of the Caldera de Taburiente on the island of La Palma in the Canaries. At nearly two and a half kilometres above sea level you can look down on a blanket of cloud that swamps the small amount of light pollution coming from any houses below. The Canary Islands lie 100km off the NW cost of Africa, and La Palma is the most north-western of the seven large and six smaller islands that make up the archipelago. In aerial photographs it looks like a giant stone axe with its pointed end indicating South. The Caldera de Taburiente has been a National Park since 1954. It consists of a ring of summits roughly 5km in diameter at the heart of the island, and the peaks outline one of the largest craters in the world. It even has its own weather system. The mountain grew out of the sea over 2 million years ago when a volcanic hotspot formed on the ocean floor and the crater has formed from subsequent erosion of the top of the shield volcano. 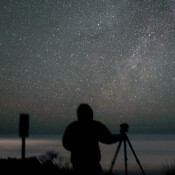 Nik Szymanek, an astronomy lecturer from the University of Hertfordshire with a passion for astrophotography, is one of the few lucky people who is welcome to stay at the top of the world. His first visit to the La Palma was over ten years ago and he has returned most years to take some stunning photographs of the telescopes and their sparkling backdrop. In fact many of the professional observatories use Nik's photos of their telescopes in publicity material. Nik specialises in CCD astrophotography so that, instead of using film to capture his images, he uses the same technology that is available in modern digital cameras. On his last trip to La Palma in December 2004 Nik took a digital camera and took a number of pictures with it to supplement those taken with his telescope and its own specialist CCD camera. All of his pictures from his trips are on his website http://www.ccdland.com. One way to get to use a telescope on La Palma is to register with the Liverpool John Moores University Telescope. JMU has built one of the world's largest robotically controlled telescope on the island. They have specially reserved observing time on the telescope for UK schools to use, making it possible for young people to study some of the amazing things that can be seen in the night sky for themselves. To register to use one of the telescopes go to: http://www.schoolsobservatory.org.uk The other three telescopes that are available are a solar telescope near Liverpool, a large refractor in London and a wide-field telescope in Japan.